with a more casual outfit. oh and can we talk about how BIG my baby is getting?! but these jeans are THE best ever. The fit is amazing, and they are so comfy! You HAVE to own a pair…and the color is just beyond perfect for summer. So go on…go get yourself a pair! Hop on over to SunshineandStilettos to enter in a $100 gift card giveaway to ShopMCE! Katlyn is hosting the giveaway for me and I am SO excited. How gorgeous does she look in our Falling Feathers Dress?! 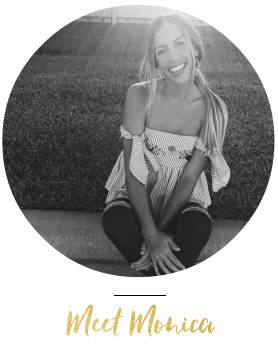 you won’t regret following her blog! Don’t miss out on this giveawayyyy! Your outfit is adorable – I love the color of those jeans and your necklace is too cute! Holy cow! Your little puppy isn't so little anymore! lol! Also, love this outfit. So comfy but still cute! Definitely entering the giveaway!